The PHH65A/PHH-65D model has been discontinued. Please see the PHH253 as a possible alternative or contact our Flow Engineering department. OMEGA ® portable pH meters are designed to be reliable, low-cost instrument for pH, specific ion, and redox potential measurements directly at the sampling site. The PHH-65A and PHH-65D are equipped with 8 AA batteries and are housed in rugged, high-impact cases that contain and protects the meter and associated accessories. For ease of use, simple operating instructions are contained in the inside cover for handy reference. 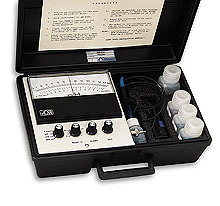 These units come complete with a gel-filled combination pH electrode, buffer solutions (pH 4, 7, 10) and operator’s manual. PHH-65D DIGITAL PH METER The PHH-65D meter features a 3½ -digit, 12.7 mm (½") high LCD display that is easy to read even in the brightest sunlight. This instrument is capable of measuring pH values from 0 to 14 with an accuracy of 0.05 pH and 0 to 1,999 mV with an accuracy of ±1 mV. The PHH-65A meter features a large 6-inch analog scale for reading both normal (pH 0 to 14, ±700 mV) and 10x expanded scale reading (±70 mV and any 1.4 pH full scale). Using the expanded scale, accuracies as great as 0.01 pH can be achieved for critical applications. 참고: These units come complete with a gel-filled combination pH electrode, buffer solutions (pH 4, 7, 10) and operator’s manual.